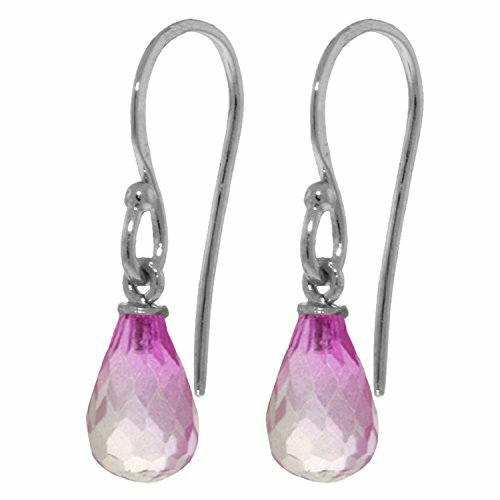 Feel pretty in pink with these white gold fish hook earrings with pink topaz gemstones. These fun and flirty earrings use only high quality materials. The earrings come in a selection of 14 karat white gold, rose gold and yellow gold. The rose gold and yellow gold color options enliven the pink topaz stones. Girly girls are sure to love the rose gold and pink topaz combination. The lovely gradient effect of the pink topaz stones is sure to have many women tickled pink; the stone'starts from a darker pink hue and gradually lightens to a softer pink. The pink topaz stones are cut in classic briolette shapes.